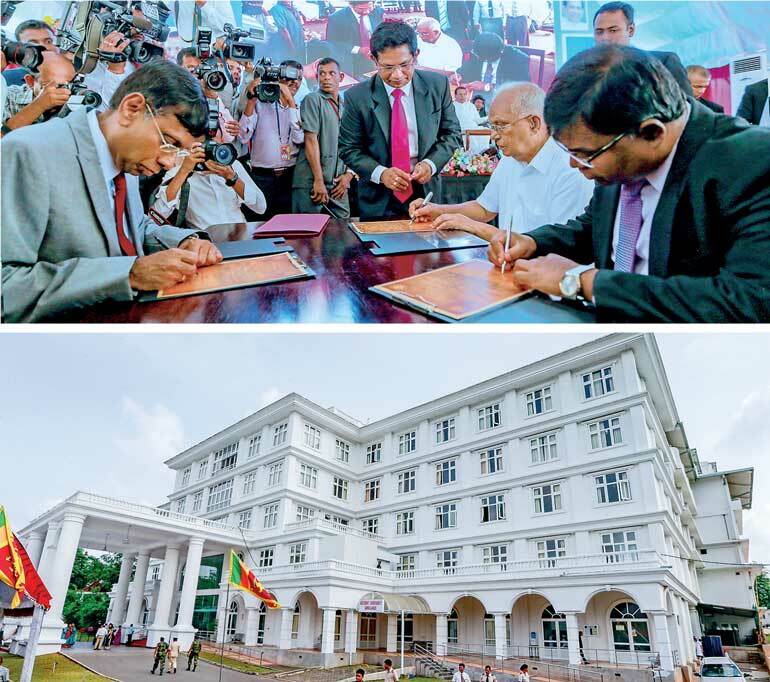 The Government yesterday took over the Dr. Neville Fernando Teaching Hospital in Malabe by signing the relevant agreement between Hospital Chairman Dr. Neville Fernando and the Ministry of Health, in the presence of President Maithripala Sirisena. Dr. Neville Fernando and Secretary to the Ministry of Health Janaka Sugathadasa signed the agreement. Accordingly, the Dr. Neville Fernando Teaching Hospital will be operated as a government hospital from 1 August 2017. The hospital, which is worth Rs. 3.5 billion, is equipped with all required facilities for a teaching hospital. It has an area of 180,600 sq feet and has been built according to the green concept. The hospital consists of one four-storeyed building and two eight-storeyed buildings. Minister of Health Dr. Rajitha Senaratne, Minister of Higher Education and Highways Lakshman Kiriella and Deputy Minister of Health Faizal Kasim were among those present at the event.